My Fascination Street: A Natural Anxiety Remedy? Maybe! 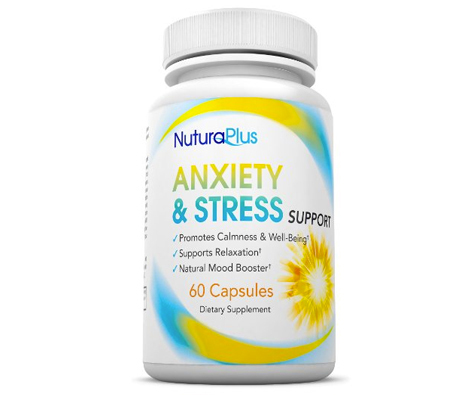 A Natural Anxiety Remedy? Maybe! I've been dealing with anxiety for a few months now and I have to say that it's not fun. I always thought people were being dramatic when they said they suffered from it but now that it's affecting me I see that it's no joke. The constant rollercoaster feeling in my stomach drives me insane, as does the lack of sleep and feeling like myself. My doctor put me on Xanax in August to help me deal with this but I've been doing a lot of research on it and even though I take a very low dosage I don't like the idea of being addicted to it. I've my share of issues with that and I don't want to start that up again. Since I'm trying to get my body and mind clear of negative energy and things that I don't need I was happy to give Nutura Plus' Anxiety and Stress Support Supplements a try. I didn't have an appointment with my doctor for two weeks but did a lot of research on these and it didn't seem to affect people on anti-depressants which was a good sign so I figured I'd give it a try. I hate taking pills, so I liked that these capsules were smooth and weren't too big for my tiny throat. These were actually easier to swallow than the 200mg Welbutrin pills that I'm currently taking twice a day. As far as it messing with my medication, I didn't notice any change. These supplements say that they help with sleep but I didn't notice that at all. What I did notice is that they didn't knock me out the way Xanax has done a few times. If I was already in a relaxed state and took a .5mg Xanax I would pass out within an hour and sleep for a while and that wasn't the case with these. They also weren't harsh on my stomach which a lot of supplements tend to be. I see my doctor in a few days for an update on my medication and I'm going to bring these in to see what he thinks. My goal is to eventually stop taking any kind of prescription medication that isn't 100% needed so if he gives this the OK I'll keep taking them until the bottle runs out and then reassess.